You’ve found and purchased the most beautiful, fragrant tea. The only problem is, you have absolutely NO idea how to properly prepare it. You don’t know the correct tea steeping time nor the temperature at which the leaves will properly release their properties. Without the knowledge to properly celebrate its beauty and the artisans responsible for its creation, you decide to save it for a rainy day. Weeks pass and there it sits, locked inside its beautiful tin. Waiting for you, the consumer, to get it together. As it would turn out, the knowledge required to produce the perfect cup of tea doesn’t require devoting your life to the art form (although, those in China who do may be out of luck). So, rather than boarding a flight to Japan in search of the subtle mysteries of Japanese tea ceremony, here’s a steeping guide that will help you brew like a master. British researchers have assessed that 80% of those who brew are doing it all wrong. Waiting the right amount of time is the key to achieving maximum flavor. Although it may be very tempting to rush through the steeping process, we only cheat ourselves when we attempt to hasten the tea along. The biggest obstacle to the perfect brew, is not knowing about the correct tea steeping time for the variety that you’re brewing. 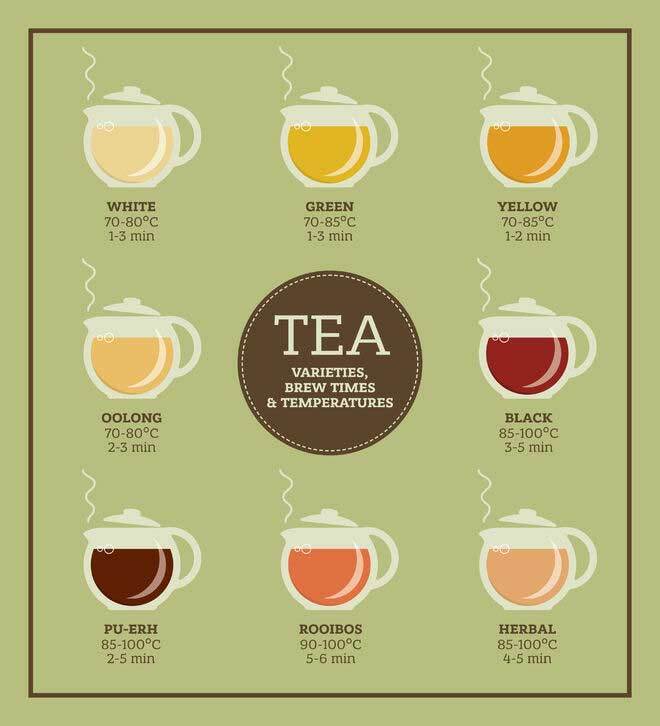 We suggest printing and laminating our small chart of the correct tea steeping time and temperatures. Keep it on your own kitchen counter-top or provide this resource to consumers so that they can better enjoy the product they purchase. There is no one perfect temperature for tea. Some teas just like it hotter than others. Black and Herbal teas seem to require the most heat to reach their peak flavor, however, fragrant and delicate white teas benefit from a cooler brew. How do you know when the time is right and the water is at the perfect temperature for steeping? Well, you’ll need the right tool. Tea thermometers ($3-$30) are your best bet to ensuring a perfect steep and there’s quite a variety to choose from. Depending on how much you’d like to spend on improving your level of tea mastery, you can find a very basic culinary probe dial thermometer for only a few dollars or go all out on a digital tea thermometer with a built in timer. Any of these devices make it easy to recognize when the time is right to add your leaves and begin the steeping process. Fancy yourself a Tea Sommelier now? Why not venture into the world of tea pairings? Another easy way to improve your cup is by introducing a higher quality water. Both will only further accent your much improved, perfectly steeped cup of tea.